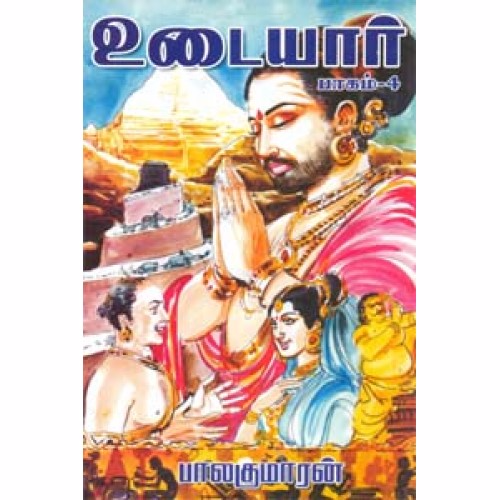 Udayar (உடையார்) is a Tamil novel written by Balakumaran. The story is written in six volumes, and is a sequel to Ponniyin Selvan depicting Rajaraja Chola's rule and the construction of the big temple at Tanjore c. 1000 CE. The story's first part Read More.. Description Udayar (உடையார்) is a Tamil novel written by Balakumaran. The story is written in six volumes, and is a sequel to Ponniyin Selvan depicting Rajaraja Chola's rule and the construction of the big temple at Tanjore c. 1000 CE. The story's first part was published in a weekly Tamil magazine and then published in monthly novels (Palsuvai novel, Ladies novel). Subsequently, 5 volumes were published as books by Thirumagal Nilayam. Thirumagal Nilayam Recently sixth volume has been released. Udayar (உடையார்) is a Tamil novel written by Balakumaran. The story is written in six volumes, and is a sequel to Ponniyin Selvan depicting Rajaraja Chola's rule and the construction of the big temple at Tanjore c. 1000 CE. The story's first part was published in a weekly Tamil magazine and then published in monthly novels (Palsuvai novel, Ladies novel). Subsequently, 5 volumes were published as books by Thirumagal Nilayam. Thirumagal Nilayam Recently sixth volume has been released. No reviews available for #Udayar-novel, Do you know Udayar (novel)?, Please add your review and spread the good things. A must read for historic novel lovers. This is a kind of book that will kinder your reading habit even if u r a non-reader. i was amazed by the way the author takes us back in time. i really felt like travelling in a time machine for a long time even after finishing reading. this book is awesome. you can see in the begining that the author follows the footprints of kalki but slowly he drags us into his own narrative style. i was in tears towards the end. thats the kind of impact it creates in the reader. you will feel as if you have lived in that period.